Please let us know about you and join our food and beverage underground community! to send you Food and Beverage Underground. 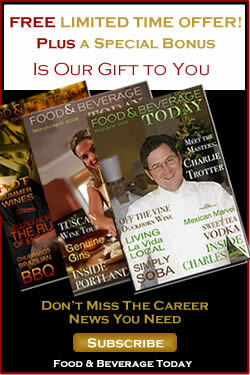 Just let us know your e-mail address and we will send you our monthly magazine and a free gift too. You don't want to miss a single issue as it will be filled with news, events, and must read articles. There will be hot deals and featured products that will save you a bundle. We have lots of plans for the site so let us know what you want too. This site is for you, the food and beverage ciommunity so help us guide it and make it your place on the internet to learn, grow and connect! We also have special discounted trips and cruises that will be offered for the community as well. Our monthly mgazine will keep you informed of all the exciting f&b underground happenings so thank you for taking the time to say hello and join the community.